“One thing holds true to every OFW out there, if they all had a choice, they would never leave their families. I know that they would do everything just to enjoy Noche Buena with their loved ones, to open gifts with their kids, to celebrate Mass with their family and friends, and to revel in the other Christmas traditions. So we would like to gift them with this opportunity." That's how Cherry Mobile's President, Mr. Maynard S. Ngu, described the vision guiding the maiden Yuletide campaign of CherryCARES, the local electronics giant's newly formed (borderline) corporate social responsibility arm. 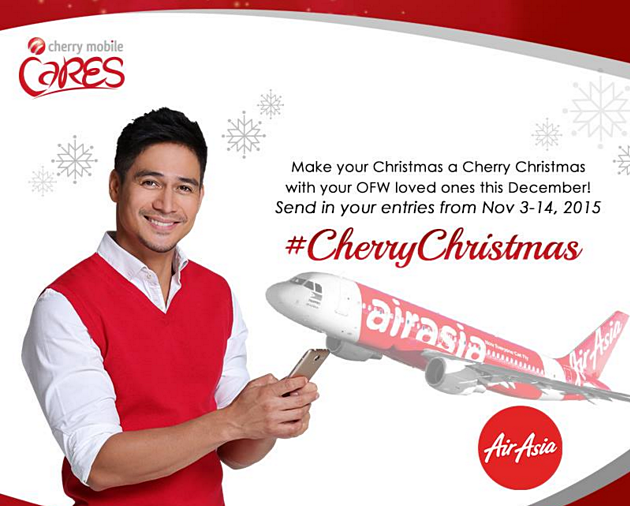 Mounted in partnership with AirAsia and CM's newest celebrity endorser Piolo Pascual, #CherryChristmas promo is the #1 Pinoy handset maker's way of fulfilling the deepest wishes of several of our OFWs and reuniting them with their loved ones this Christmas. "Cherry Mobile, the leading mobile phone brand in the country that values your lifestyle, has always put the Filipino first, and so it is with great pride and pleasure that we bring together the Filipino family on the most important day of the year," shared Ms. Kat Arceo-Ocampo, Cherry Mobile Marketing Head. Open to all Filipino active Facebook users who have a family member working abroad (that is, anywhere outside the Philippines), #CherryChristmas promo invites participants to share why they would like to have their loved ones home for Christmas. They can share their answers through a 1-minute video, which will be uploaded through the #CherryChristmas app on the official Cherry Mobile Facebook page (Kindly read the full mechanics of promo on the same page). Ten finalists that garner the most points, based on the judges score-sheets (story, concept, and uniqueness, and technical value are the main criteria) and the online votes will be declared the Top 10 winners. Each OFW Prize Recipient a brand new Cherry Mobile Premium Flare S4 Plus phone (with Php 7,999 SRP), a Noche Buena package worth Php 5,000, and Php 30,000 in cash! On top of that, AirAsia will even provide round-trip flights to prize recipients to Manila from any of the following locations: Hong Kong, Macau, Kuala Lumpur, Kota Kinabalu, and Korea. So if you have a loved one who's working in those places, make sure you send at least one entry. Qualified participants may submit their entries starting today until November 14, 2015. The voting process, on the other hand, will from the 16th until the 23rd of this month while the official announcement of finalists will be done on November 29, 2015. "We care for our OFW kababayans. Send them home this holiday and have a #cherrychristmas," said Mr. Piolo Pascual - CM's celebrity endorser for this generous promo - on his Instagram account.